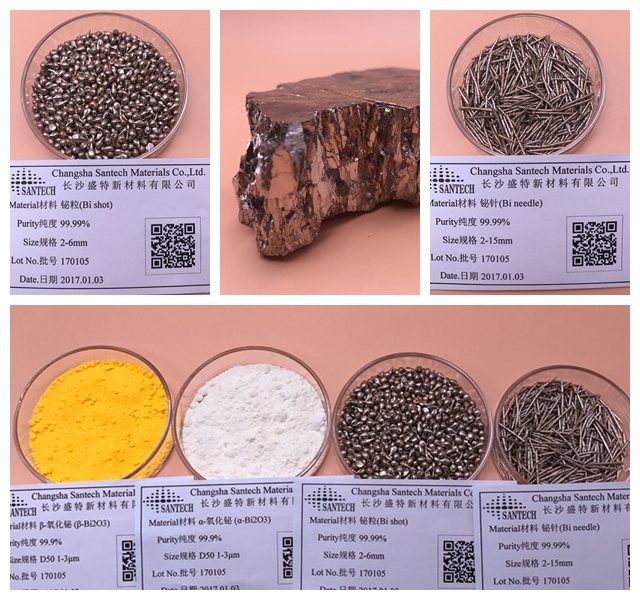 Exploring Tellurium Bismuth, the Second National Treasure - Changsha Santech Materials Co., Ltd.
Tellurium bismuth resources are widely used in traditional application fields, mainly high speed steel, non-ferrous metal alloy additives, petrochemical catalysts and chemical products. With the development of technology, the demand for military industry, aerospace, semiconductors and other fields is increasing day by day. According to the forecast of industry experts, the global total demand for relevant industries is about 1600 tons in 2020. Ya 'an, as a part of the Panxi strategic resources innovation and development experimental area, has tellurium and bismuth resources, which are known as " the second national treasure". The tellurium bismuth pyrite in Dashuigou, Shimian County is the only " tellurium independent primary deposit" reported in the world so far. Tellurium bismuth resources are widely used, and the demand is soaring. According to reports, the market price of industrial tellurium rose from 280,000 yuan / ton in 2003 to 1.6 - 2 million yuan / ton at present. " Because the technology cannot be reached, we can't make use of it only by one park, one county or even by Ya 'an City." Yang Benjun, deputy director of the management committee of Shimian Industrial Park, told the Financial Investment News reporter that although Ya 'an has tellurium and bismuth resources and the state has started protective development and utilization since the end of 2003, it has not yet realized industrialization. The inclusion in the Panxi strategic resources innovation and development pilot area has given Ya 'an hope. The convening of Ya 'an Tellurium and Bismuth Science and Technology Forum in Panzhihua Vanadium and Titanium Industry Expo 2014 invited top experts and scholars in the field of Tellurium and Bismuth research to gather strength to jointly tackle key scientific and technological problems of Tellurium and Bismuth resources and to make innovative development proposals. In 1991, in the process of mining pyrite, Dashuigou, Shimian County, Ya 'an City, discovered tellurium bismuth ore, which is the only independent primary tellurium deposit reported in the world so far. The news caused a sensation and was called the " second national treasure" after giant pandas. After the approval of Panxi Strategic Resources Innovation and Development Pilot Zone, tellurium and bismuth resources have become the focus of people's attention and exploration. Reporters enter Shimian Industrial Zone. In the office area, a gray and inconspicuous " stone" attracted everyone's attention. " This is tellurium bismuth ore. Only Shimian County has primary deposits." The interpreter told the story. Because of the scarcity, many people came forward to take pictures and try to hold the stone. " I thought it was only over 10 kg like ordinary stone, but I didn't think it would be so difficult to hold it, it was estimated to weigh 40 to 50 kg." A visitor told the story. According to the relevant person in charge of Shimian County Industrial Park, tellurium is a rare and scattered element with very low average abundance and little content in the earth's crust. According to statistics, there are 149,000 tons of tellurium on the earth. China is a large country with tellurium resources. It has found about 30 associated tellurium producing areas. Now it has been proved that the associated tellurium reserves are in the third place in the world and the tellurium resources reserves are about 28,000 tons. The vast majority of pure tellurium obtained by all countries in the world is comprehensively recovered from the smelting of non-ferrous metals such as copper, lead and zinc as an associated component. Dashuigou Tellurium Bismuth Deposit in Shimian County of Ya 'an City was discovered in 1991 during the mining of pyrite. It is the only independent primary tellurium deposit reported in the world so far and is called the " second national treasure" after giant pandas. From 1992 to 1993, Sichuan Nonferrous Rare and Precious Metals Co., Ltd. determined it to be an independent tellurium bismuth deposit, which was surveyed by Sichuan Bureau of Geology and Mineral Resources. On October 25, 2003, Sichuan Provincial Department of Land and Resources issued the Notice on Protective Development and Utilization of Asbestos Tellurium Bismuth Ore ( Sichuan Land and Resources Letter [ 2003 ] No. 767 ). Asbestos Tellurium Bismuth Ore is listed as a kind of protective development and utilization mineral, four mining areas of Asbestos Dashuigou Tellurium Deposit, namely Dashuigou, Majiagou, Baiyagou and Shangfeishui, are listed as protective development planning areas, and vein No. 14 of Majiagou Mining Area and section III - 3 of orebody No. 1 of Dashuigou Mining Area are listed as permanently reserved tellurium bismuth veins and sections. After investigation, the three mining areas approved so far have preliminarily proved that Dashuigou in Shimian County has 332 + 333 + 334 types of tellurium bismuth ore with 25190 tons, 273.7 tons of tellurium metal and 439.63 tons of bismuth metal. What is the use of tellurium bismuth resources? In the traditional application field, it is mainly high speed steel, non-ferrous metal alloy additive, petrochemical catalyst and chemical products. Tellurium accounts for 78% of the total application in metallurgical industry. The petroleum and chemical industries account for about 12% of the total tellurium application. Tellurium is used in more than 8% of the electronic and electrical industries. Tellurium also plays an important role in glass, ceramics and medicine. In the field of high and new technology, rare and scattered elements such as tellurium are praised as " vitamins of modern industry, national defense and cutting-edge technologies, bridges to create miracles in the world" and " supporting materials for modern high-tech new materials". With the rapid development of advanced technologies such as aerospace, atomic energy and electronic industry, the demand for rare metals including tellurium is increasing day by day. Tellurium has special thermoelectric and photoelectric conversion properties. With the development of high-tech industry, it has become a good material for semiconductor refrigeration ( heat ) and infrared detection, especially for solar energy conversion into electric energy. With the development of solar cell industry and semiconductor refrigeration industry at home and abroad, the demand for tellurium has increased dramatically. Among them, the average growth rate of the solar cell industry in the past five years has reached 43%, and the world's total output has reached 5500MW by 2010. According to industry forecasts, the world's installed photovoltaic power generation capacity will reach 14GW in 2012. The annual demand is about 400 tons, calculated on the basis that the photovoltaic industry generates 3000MW of electric energy and needs about 90 - 130 kg of tellurium per MW ( megawatt ). China is a major consumer of tellurium. The annual demand for tellurium in the semiconductor refrigeration industry alone can reach 40 - 50 tons. Combined with the needs of the global refrigeration, metallurgy and solar cell industries, the total annual demand is about 700 - 800 tons. According to the forecast of industry experts, the global total demand for relevant industries is about 1600 tons in 2020.